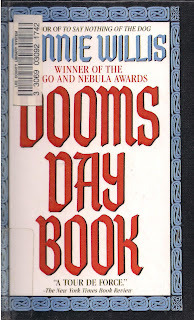 Doomsday Book completes the Grand Master Review Challenge over at WWEND for me. It has been great fun and all the other participants are great people. Getting involved with their challenge has seriously been one of the highlights of my year. I can't wait for the reveal of next year's challenge! Time travel happens. And if you’re an excitable undergad historian that means you can have the chance to visit your very favorite times throughout history. For Kivrin Engle, that means the Oxford of medieval England – 1320 to be exact. When the drop is botched and the entirety of Oxford-Present comes down with a deadly virus, Kivrin’s professor, James Dunworthy is racing against the clock to save her, whether she needs saving or not. Meanwhile, Kivrin herself must cope with translation issues, debilitating sickness and some pretty intense experiences of humanity. The key to whether one enjoys Doomsday Book is in the narrative shifts. Despite overwhelming sickness, darkness, dirtiness and you know…the possibility of being raped, burned at the stake, or contracting the plague, the tale of Kivrin’s journey to the fourteenth century was so vibrant and emotional, and the townsfolk so distinctly human, that it was probably one of the more compelling stories for me. Mostly, Kivrin herself was just a great experience. Before she even leaves the present and without actually hearing much from her, Kivrin establishes her personality pretty forcefully. She’s eternally optimistic, idealistic and just a damn enthusiastic medieval historian, despite only being an undergraduate. Her enthusiasm is constantly under attack once she successfully drops to the 1300’s and watching experiencing her transformation from simply student of history to something less naïve and much more painfully aware of the unifying humanity and faith present throughout history but especially in a small town besieged by utterly terrifying illness. Kivrin’s gradual understanding of Father Roche was also particularly good and it was a transformation of different sort. From incapacitating fear of Roche to pity and then fierce admiration, Willis kept me with Kivrin through the whole damn thing and sometimes it was pretty dang gut-wrenching. Then there was one moment after Kivrin recovered from her sickness and was just beginning to take care of Agnes (“Agnus” – oh man, I really loved that kid!) that had me laughing uncontrollably for over a minute. I might have been affected by extreme exhaustion at the time but – no joke – I could not stop myself giggling like an idiot. Whenever Willis…I’ll say it…forced me to break away from Kivrin’s story in the beginning, it was quite difficult to care about Dunworthy’s apparent doting over Kivrin and whether the drop was accurate. After a good 100+ pages, and still not being sure whether Kivrin was in the right place, I was starting to feel like this plot line was just to tease us, and honestly on one or two occasions, slightly annoyed. After the threat of influenza had become ominous enough and especially as the relationship between Dunworthy and Colin started to seriously blossom, and the antics between the nurses, Americans, and academics became ever more akin to the tomfoolery of a Monty Python farce. Notwithstanding my serious love for Kivrin and her fantastic voyage I did begin to appreciate, at long last, both sides of the story. This was my first read of Willis and in the months prior to reading this one, I heard a number of complaints, mostly about being long-winded. I thought the length was just fine but I can somewhat understand why folks gripe about Willis taking forever to say something; she drags out the contagion suspense longer than I would have thought humanly possible. I eventually came around to it, but I'd caution anyone to be prepared for some amount of frustration probably. Compared to the rest of the early 90’s winners, Willis’ tale of time travel was a welcome departure from incessant detail and explanations of some of the very serious and science-heavy tomes of the period. This is fun no matter when you read it though. The children in both time periods were amazing (Colin’s gumball!) and Kivrin was a saint. This will very likely become one of those books I read many times in my life. 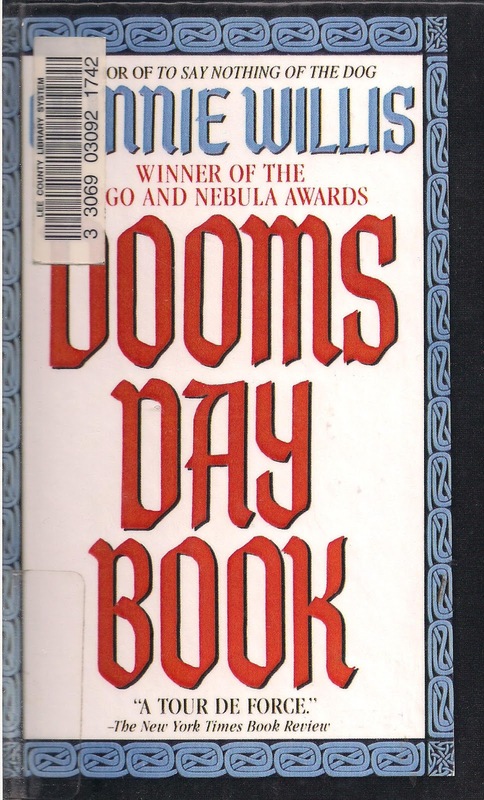 I just picked up The Doomsday book and Hyperion both for fifty cents at my library today. Looking forward to both.